Northwestern Engineering’s Michael Jewett has received the 2018 Young Investigator Award from the Biochemical Engineering Journal. Launched in 2009, the annual award recognizes outstanding excellence in research and practice in the field of biochemical engineering. 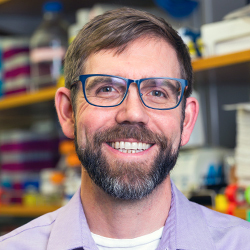 As the award recipient, Jewett will edit a special section in a future issue of the journal, which will be focused on using cell-free synthetic biology to manufacture proteins, protein engineering, and paper-based diagnostics. He will also deliver the keynote speech at the 12th European Symposium on Biochemical Engineering Sciences, which will take place September 9-12 in Lisbon, Portugal. His speech will discuss biology by design, cell-free systems, and synthetic biology. Co-director of Northwestern’s Center for Synthetic Biology, Jewett works to understand, harness, and expand the capabilities of biological systems for applications in medicine, materials, and energy. His research group designs, constructs, and modifies biological systems involved in protein synthesis and metabolism to understand how nature’s design work and use that information to develop new products. Rather than attempt to balance the tug-of-war between the cell’s objectives and the engineer’s objectives, Jewett aims to discover efficient new strategies for designing and constructing cell-free systems that transform ensembles of cellular machines — such as the enzymes that make protein therapeutics — into systems that can be engineered just as integrated circuits are engineered today. Jewett is a member of Northwestern’s Chemistry of Life Processes Institute, the Northwestern Institute on Complex Systems, and the Robert H. Lurie Comprehensive Cancer Center. He has received numerous awards, including the American Chemical Society Biological Technologies Division Young Investigator Award, David and Lucile Packard Fellowship for Science and Engineering, Camille Dreyfus Teacher-Scholar Award, NIH Pathway to Independence Award, Cole-Higgins Award for Teaching Excellence, Agilent Early Career Award, 3M Non-tenured Faculty Award, and DARPA Young Faculty Award.